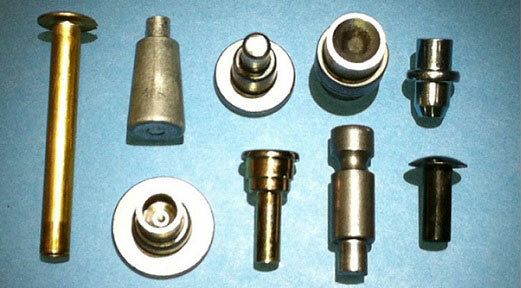 Universal Rivet is pleased to be a leader in the supply of solid rivets. Thanks to a number of years of industry experience, we have the knowledge necessary and are committed to ensuring that you receive the best products available. One thing that should always be kept in mind when procuring rivets is that the quality of the products you produce is largely based on the quality of the products you use in that project. Using quality solid rivets ensures that your products will live up to your standards, as well as those of your end customer. Solid rivets are often the ideal choice for a variety of different projects because they are the strongest type of rivet used in fastened joints. Featuring a manufactured head at one end and a solid shank on the other end, solid rivets can also be produced with a chamfered cut-off end or a straight cut-off end, depending on your manufacturing needs. It's also possible to apply a secondary heat treatment known as annealing to the solid rivet in order to increase ductility before clinching in for certain applications. Along with their superior strength, solid rivets also provide the benefit of high-speed assembly. When time is of the essence, which is usually the case in any manufacturing environment, this can prove to be of the utmost importance. Additionally, solid rivets offer the benefit of ensuring that the permanent fastener cannot be removed without destroying one of the heads of the rivet. This feature alone provides increased security and strength. Compared to threaded fasteners, solid rivets provide an inexpensive and effective alternative solution. In order for the rivet to be fastened, the end of the shank will need to be pressed, impacted, or spun once the rivet has been placed into the workpiece. If you choose to press clinch or impact the rivet, the force necessary will cause the rivet shank to swell in order to fill in the entirety of the workpiece space. Of course, it must be noted that a drilled or pre-punched workpiece hole is necessary in most applications involving solid rivets.